The big day might be scheduled next year, but you’re wondering about paying for items right now. Weddings have never been inexpensive affairs. They always take a good chunk of money. Whether your wedding has an estimated cost of £5,000 or £50,000, there are clever ways to save up for it. Take a look at how you can realistically pay for your wedding. The traditional rule was the father of the bride paid the wedding bill. Today’s rules are a lot more relaxed. With weddings costing thousands of pounds, it makes sense for everyone to chip in. The engaged couple should meet with both sides of the family. Discuss the costs with nothing held back. Ask for a few donations from every family member. The contributions may vary between individuals, but it still helps. Most parents want to pay for the majority of the wedding. Both sets of parents might split the bill entirely. Many couples go the route of using a personal loan for the wedding. Today’s rates are relatively affordable for £10,000 or even £25,000. Shop around for these loans. You might ask your bank about options too. Because you’re a current customer, they might have low-interest loans to help you out. Try to choose a loan that can be paid back in two or three years. Stretching the loan out to five or six years requires a lot of interest to be paid back. A credit card is a clever way to pay for a wedding if you know how to use the features. Apply for a new credit card that has a long introductory period. It might advertise 18 months interest free on all purchases, for example. In essence, you have an 18-month loan on these cards. As long as you pay off the balance by the time 18 months is over, there’s no interest to worry about. You may have put money into your savings account for years. It was just habit as each paycheck rolled in. Take a look at your collective savings right now. With the interest accrual, there may be a good chunk of money already saved up. Consider other savings accounts too, such as certificates of deposit. They mature at certain points in time. You might have a CD that will mature just in time for the wedding’s main bills, including catering, venue payments, and potentially the wedding photographer, videographer and video editor. One of the simplest ways to pay for a wedding is by budgeting for it. This strategy takes time, however. Plan for a wedding that’s one or two years away. If you’ll need £10,000 for it, you’ll need to save about £833 a month for a wedding that’s scheduled 12 months from now. Stretching out the time will reduce that monthly amount. Saving money doesn’t have to be difficult either. Put off a mini-vacation, brew your coffee at home and cook dinner together. The savings can add up real fast. Pay for your wedding by tapping into your artistic side. Many people knit or create jewelry that others are dying to try or buy. Go online, set up a seller’s account and advertise your artistic genius. Some couples try two, separate accounts or work together on one goal. It can truly pay off in some cases. On occasion, the account turns into supplemental income even after the wedding is over. Remember to properly divide your time, however, so that the venture doesn’t become too overwhelming. Many couples roll the wedding and honeymoon expenses into one, big package. Although it’s traditional to head off into the sunset on a grand honeymoon right after the wedding, you can be more progressive. Delay the honeymoon until next year, for example. Focus on paying for the wedding first. In many cases, you’ll have a much smaller amount to save up for right now. Once the festivities are over, work on savings for the honeymoon. Many couples see this strategy as a way to reduce stress and stretch out their newlywed period. At the end of the day, remind yourself that the real goal is spending the rest of your life with your significant other. 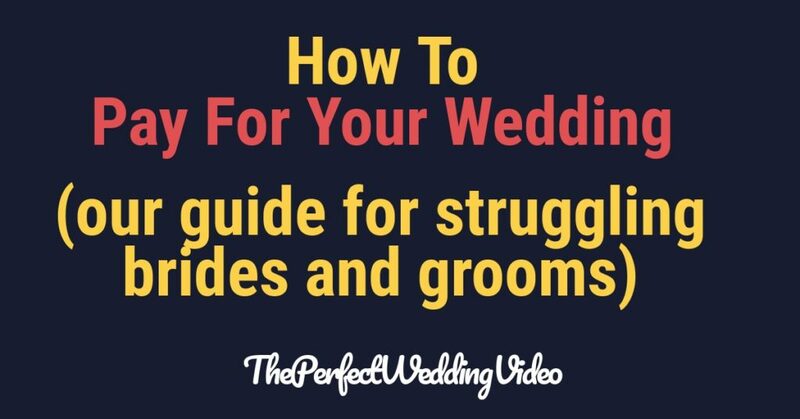 Take the wedding challenges in stride as you lead up to the big day. The event will be a memorable one regardless of the amount you spend.